Published: Dec. 16, 2018 at 07:52 p.m. 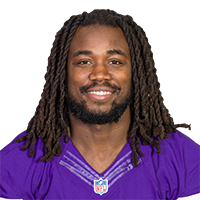 Published: Dec. 16, 2018 at 01:31 p.m.
Minnesota Vikings running back Dalvin Cook scores his first rushing touchdown of the season for 13 yards. Published: Dec. 16, 2018 at 01:13 p.m.
Minnesota Vikings running back Dalvin Cook takes a pass from quarterback Kirk Cousins 27 yards. Published: Dec. 10, 2018 at 11:11 p.m.